NEXT | What is your favorite cosmetic pet? I get really in-depth in the answer to a question today about why people stay with video games. There’s a lot of different reasons why and it was fun to explore a few of them. I hope you enjoy! Which Old God do you worship? I originally thought I’d answer Yogg-Saron, if only because of the number of times I’ve been mind controlled by him. But I realized that such is only surface worship and not really indicative of true beliefe if I had to go so far. After all, any Priest of Azeroth of sufficient level can mind control anyone, so it’s really fake worshping. 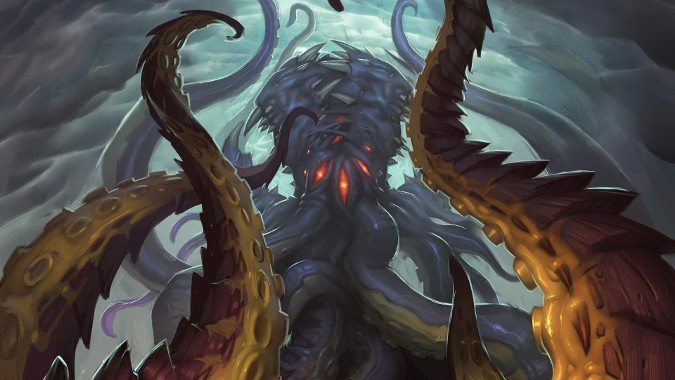 N’Zoth, on the other hand, he’s got a certain chaotic level to him that is … well, I wouldn’t call it appealing, but for those that are into the whole anarchy thing, I could certainly see why. He more or less controlled all of Kalimdor at one point and was the driving force behind Deahtwing’s Cataclysm that reshaped the land. Nothing created as much chaos in Azeroth’s recent ages, and in doing so Deathwing became Chaotic Evil, right along with N’Zoth. And really, order cannot exist without chaos, so who doesn’t want to switch sides and worship a bit of the wild once in a while? Sometimes all you want to do is set the world on fire. Don’t you wish it was easier to say “This isn’t for me anymore?” I feel like so many people are unnecessarily sticking around and complaining about things instead of just moving on. People’s tastes change, circumstances. It’s okay if a game isn’t for you anymore. This is a really interesting question that I’m going to dive deep into. In the wake of the Diablo Immortal backlash and the continual cycle and movement of the “I love it” / “I hate it” groups that come about with every WoW expansion, there is something to look at here and understand why there seems to be an unwillingness to change, either at the personal level or at the systems/functional level of the game. There’s a few areas to talk about why people don’t just say “this isn’t for me anymore” and move on. This is the big one. People get invested into Blizzard games for a variety of reasons. Yes, they’re almost universally incredibly well done works of art that have a lot of depth and replayability, but they also have a lot of systems in place that reward the pleasure centers of our brains. That makes it more difficult for us to physically leave the game, because we want those pleasure centers to activate. When we win a battleground, we get a reward. When we complete a quest, we get a reward. When we win an Overwatch, Hearthstone, or Heroes match, we get some points and progress towards rewards. All of these things combine into a psychological system that feeds into itself time and time again. Is this bad? I’ll let others argue that point — I honestly don’t want to get into it right now. But what it does, no matter if you think it’s good or not, is create a strong sense of investment in the game. This investment is center to why people won’t leave a game — once you have a strong connection to something, you’re less likely to disengage from it. This holds true to books, relationships, restaurants, comfort food (chili), cities, pets, video games, etc… Even when things don’t go your way, you’re likely going to stay. Just as people can become invested in the game itself, people get invested in the people that play the game. Look at the number of guilds in WoW and other massive games that have been around for over a decade. There’s a lot of them — the same goes for sports teams and other social clubs. Heck, one could say (rightfully, to an extent) that Blizzard Watch falls into this category. People investment is a very strong reason why individuals won’t leave a game. We are social animals — and we thrive on that social connection. In early human history, when we were hunters and gatherers, we would stick together to survive. This obviously meant that while certain individuals would not want to go into one area, they nonetheless kept with the pack because without them there would be no survival. Yes — or instincts have developed beyond this (one might say only slightly), but the basic sense of social grouping is still there. A hallmark of WoW, in particular, has been its group-centric gameplay. Once you’re in a good group that you’re not going to leave, you have a strong will to stick out changes to the systems and story that would otherwise cause you to jump ship. If I don’t like the way the way Witcher 3 goes, I’ll stop playing. But if I don’t like the way WoW goes, I’ll keep playing so I can engage in social acitivites with my friends. Once you’ve played a game for a bit you’ll start to recongize that things go in cycles — sometimes you won’t like what is done to the game, but othert times you’re going to love it. As the Cylons say, it has happened before and will happen again. Even if the WoW story and gameplay isn’t hitting your mark right now, chances are in an expansion or two you’ll have another Legion or Mists and you’re going to be in love again. You know things will get better, and your brain is telling you that the cost of leaving entirely is outweighed by the benefits of staying. Note that “staying” isn’t necessarily staying and playing the game, as much as it is staying and being connected to the community and the game via keeping up with news, talking about it on social media, and maintaining a general interest. This realization struck me several years ago when I was talking with readers who came to BlizzCon, came to our party, and told me that they don’t play any Blizzard games anymore, but still read our site and actively participate in the community. When I asked why, every single one of them said that it’s because they just didn’t like things right now, but they’re sure they will again. This is a huge testament to Blizzard’s long term reputation and the culture that they have developed (and one I hope to see continue for a long time, although I have some doubts — but that’s for another article). And while this culture provides a lot of positives, at the same time it does lead to vocal people who were wanting to return to the game now, but are very disappointed that they’re not liking what they’re seeing (aka: Diablo Immortal). Let’s not ignore the human ability to be stubborn either. It’s a trait that my wife and mother both like to remind me often enough that I have, and when I’m feeling like getting into an argument I can’t win, I like to tell them they have it too. This ability to be stubborn isn’t a bad thing either. Consider what it did for early humans and modern humans. When we were those pack animals the stubbornness gave us the “don’t quit” attitude to race the extra mile for food or gather the wood for a longer fire so we could spend it with our group. In modern days, stubbornness is essential in pursuing an idea that you know will succeed even though you’ve been told by people you’re wrong. Granted it can backfire, but sometimes it works wonders. I’ll point to AOL closing WoW Insider and telling us the site wouldn’t be profitable, and almost four years later sitting here at Blizzard Watch typing up The Queue. Stubbornness succeeds, sometimes. In the gaming context “I hate this mechanic, but I’ll be damned if I’m going to let it stop me from killing Diablo” has a lot of power to it. It drives one to success, and with as good as Blizzard games are, the stubborn factor can be a significant draw to people even though they don’t realize it initially or in the moment. For me, this is Skyrim seven years later. One day I’m going to do a complete game and have everything done. It might take me another seven years, but I’ll finish if it’s the last thing I do. I’m leaving this at the bottom of my list because while it’s a legitimate reason why people stick around and play a game they don’t like, it’s also the least worth one I believe; and one that can be overcome with leading a life that is centered around more mindfulness. Some people just like to complain, and they see value in being snarky and cynical. We all know these people. And I’m going to admit something I haven’t ever admitted to in writing before: I used to be one of those people. I’ve since made a conscious effort through therapy, meditation, and self-reflection to remove that trait from me. I’m better off for it; but having overcome this I see it rather often in some of the most vocal people who “stick” with a game but do nothing other than complain about it. So this is a very long-winded way to answer your question. There are a lot of reasons people stick around with a game they don’t like anymore, some more healthy than others. But either way, that’s their choice. After last weekend when I had a rather extreme series of attacks on Social Media, I got to exercise the part of myself where I just ignore the haters. It’s something that I was taught from day one at WoW Insider eleven years ago. The same goes for people that stay around even though they’re having a hard time moving on — if you can and want to listen to them (they can have amazing feedback, especially if delivered correctly!) cool, if not, I recommend scrolling on past and look on the bright side of life. Maybe already answered but what’s your favourite thing from BlizzCon (panel, announcement, moment)? My favorite thing was the WoW: What’s Next panel. Because if it did only one thing, it did it very very well: Blizzard is following the Legion model and plans on releasing substantial content and stories over the life of this expansion. To me that means BfA will not become the next Warlords of Draenor, and instead become the next Legion.